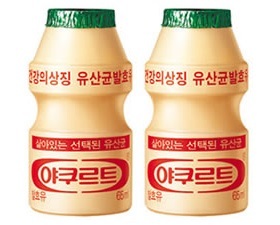 Yakuruto or yakult is a popular after meal, probiotic milk-like product which is sweet in taste and enjoyed by Koreans at restaurants or at home. It is made by fermenting a mixture of skimmed milk with a special strain of the bacteria which helps in digestion of food. It was originally created by a Japanese scientist and marketed in different sizes worldwide to nearly 30 nations. In the Americas (including Mexico, one of yakult's largest selling markets), South Korea, Japan, Philippines, and Thailand, 80 ml bottles are available. It is also available in Singapore, Hong Kong, Taiwan and mainland China where it comes in 100 ml bottles. Yakuruto is made by Yakult Corporation which is one of the largest food companies in South Korea and produces beverages, ramen noodles, and dairy products.